Taylor's high school band concert was tonight. Taylor is the first chair trombone and played very well. It has been fun to hear his progress through the years. After we came home, most of the kids were getting ready for bed, so it was just Sophi, Taylor and me in the kitchen. Both kids were wanting a bedtime snack. Sophi asked for a glass of milk, which I got for her. When I set it down in front of her, she said: "I LOVE milk!" Sophi thought for a short second, then responded with a grin, "I love TAYLOR more!" Taylor quipped: "Good job, Soph!" Sophi's grin grew larger and larger and she excitedly asked, "Did I answer the test???" Jessica is one fantastic human being. She is a joy and a light in our lives. She has some very unique and quirky ways of interacting with others. She often wants to communicate through sign language. Not actual ASL kind of sign language, but her own made up variety. On her first attempt to explain something this way, it's kind of cute. When she decides she's not going to use words despite a 5+ minute "failure to communicate," it can get a bit tiresome. Another way she likes to get her point across is through handwritten notes. Sometimes these notes are written left to right, top to bottom like normal English. But if she runs out of room, they may just float around the page wherever she finds room. This morning I was making lunches. Jessica was eating breakfast at the bar. She said, "Today you don't have to ask if I want home or school lunch. You can just look!" As she said this, she pointed at the refrigerator, where the school lunch calendar was posted. I walked over and looked at the calendar. Today's menu was ravioli. I wasn't sure whether that meant home or school. I asked her to clarify. Again she pointed at the fridge. No words. "I look at the floor." She deigns to verbalize. "Look under the calendar." So I look at her meanu [sic]. I get that the snack is popcorn (no idea what is in the first set of parenthases) and see that it is from last night. The fruit is mango. Dessert is girl scout cookies (mint kind). The drink is a quarter. And the main dish is...potato chips? As you look at this menu, you may think, "don't you need something substantial? A sandwich perhaps?" Well, in addition to Jessica's quirky communication, she has a patently persnickety palate! Trying to find food she is willing to eat can be quite the chore. Sandwiches of any kind definitely do not fit the bill. I asked, "Are potato chips really your main dish?" She takes the note and points to the long arrow. I stare blankly. She points to the long arrow and gives me a very intense glare. Perhaps an attempt at mind control? I continue to stare blankly. Finally I say, "Jess, I don't understand." Unimpressed with my lower-than-average intelligence, she rolls her eyes and says, "The arrow is going both ways. That means they are switched. POPCORN is my main dish! Two handfuls." (Now I see what the first set of parentheses says.) Gotcha. And potato chips are the snack. 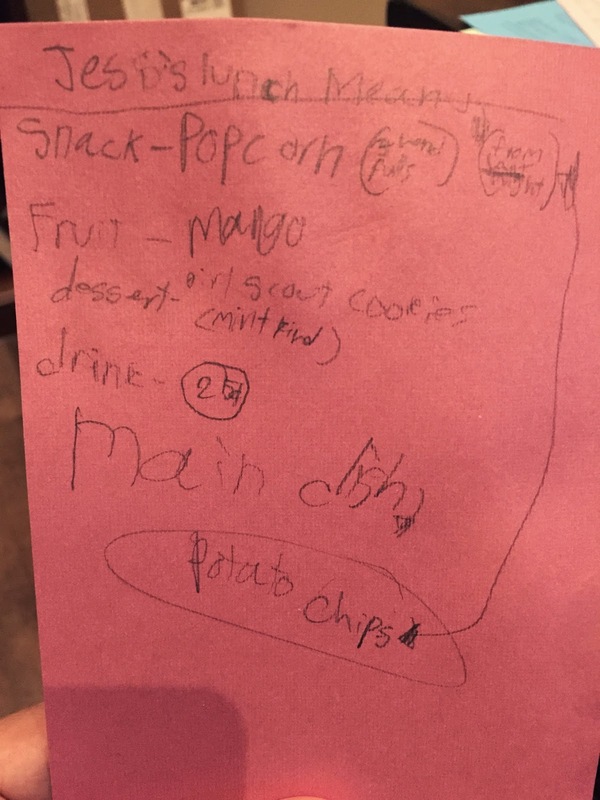 I try to explain that popcorn, girl scout cookies and potato chips don't constitute a very healthy meal. "Well, I do have mango." Back and forth we go. This entire exchange is taking far too many valuable before-school minutes. I become a bit frustrated, let out a loud sigh, lean back against the counter and slump down with a look of exasperation on my face. 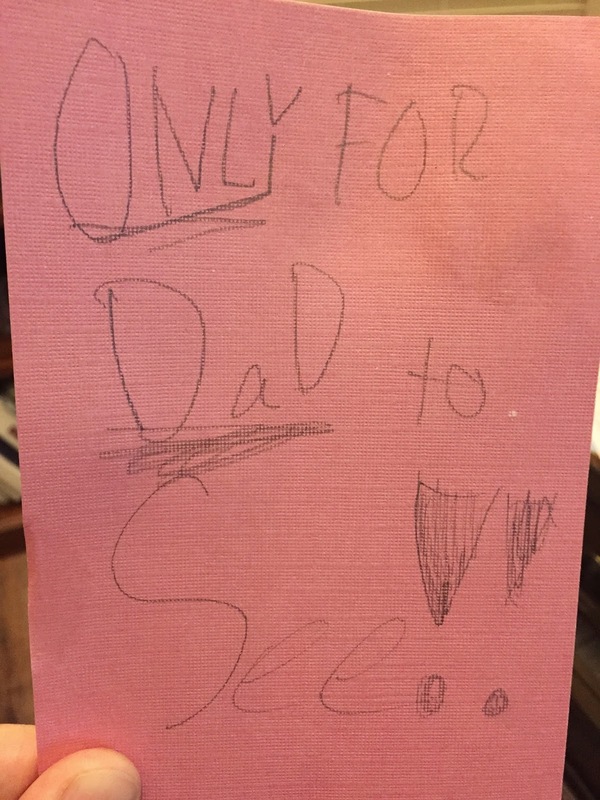 Sophi, who has witnessed the entire conversation from her perch at the bar, smiles sweetly at me and, in her most patronizing-because-I'm-talking-to-a-kindergartner voice says, "Dad. Where's your happy face? Let's put a smile on!" Thanks for the reminder, Soph. Life does go on! I can't even remember what ended up in Jesi's lunch, but I'm pretty sure the chips got nixed. Well, done! You have a good memory. I'll see your patently persnickety palate and raise you a luscious loam overlying limestone.